Drunk driving is still the #1 cause of death on our roadways. Think it doesn't impact you? Think again. Every two minutes, someone is injured in a drunk driving crash, and every 51 minutes, someone is killed. Two out of three people will be impacted by a drunk driving crash in their lifetime. If it's not you, it's going to be someone you love. Since its founding in 1980, MADD has reduced drunk driving fatalities by half and saved nearly 380,000 lives. This is significant progress, but it's not good enough. MADD remains focused on one number - zero. Zero deaths. Zero injuries. Zero families impacted by impaired driving. And they have a plan to accomplish this goal. When MADD first began, drunk driving was seen more as a nuisance, something that really wasn’t a big deal. Since then, MADD members have worked tirelessly to educate people on the dangers of this violent and unnecessary crime, and through legislation and advocacy, MADD has been changing how we talk about the crime. MADD believes that drunk and drugged driving incidents are crashes not accidents because they are the result of choice, not chance. This seemingly insignificant change in lexicon reinforces that drunk and drugged driving are 100 percent preventable crimes, 100 percent of the time. As a result of these efforts, public perception around drunk driving has changed, but there is still some work to be done. Unfortunately, the American Judges Association (AJA) recently published an article that described individuals that make the choice to drive impaired merely as, “social drinkers who went a little overboard. They’re not alcoholics or criminals. Most of the time they’ve done nothing dangerous, but have merely violated a law…” This is a clear mischaracterization of a crime that kills more than 10,000 people and injures another nearly 300,000 individuals per year. Further compounding this issue, attorneys still commonly advertise using this improper language. Even those that seem to have victims’ best interests in mind inadvertently minimize this tragedy by calling this crime an accident at all stages of the process. We must be clear here. Drunk drivers violate the law. Drunk drivers commit a crime. If we are going to create a world with no more victims of these crimes, we must speak the same language. Drunk and drugged driving is a crime and one that is easily preventable. Click here to make your voice heard, by signing MADD's open letter to the American Judges Association and American Bar Association. On any given day, your family shares the roadways with more than 2 million drunk drivers who have had three or more prior convictions. While suspending the license of these individuals makes sense, in reality, three out of four of those with a suspended license continue to drive. That’s why MADD supports the usage of ignition interlock devices to require all convicted drunk drivers to prove they are sober before the car will start. CDC research finds reductions in repeat offenses of about two-thirds due to interlocks. However, while ignition interlocks have the power to reduce repeat offenses by two-thirds, in order for these devices to work - states must pass laws requiring interlocks for all offenders. And even when laws are passed, they are not always enforced. Click here to learn more about how ignition interlocks work and what you can do to help. A generation ago it would have sounded absurd that inflatable bags of air would help protect us in a car crash; now, every new car has them. Today’s cars can even parallel park themselves and have anti-theft sensors that can shut down the engine. Now imagine a car that will protect your family from drunk driving by automatically determining whether or not the driver is above the legal limit of .08 BAC and failing to operate if the driver is impaired. It's possible, and that is the car of tomorrow. In 2006, MADD, the government, traffic safety advocates and members of the automotive industry created a panel to encourage and support the development of new technology that would stop drivers from operating a vehicle if drunk. The result was DADSS or Driver Alcohol Detection System for Safety. 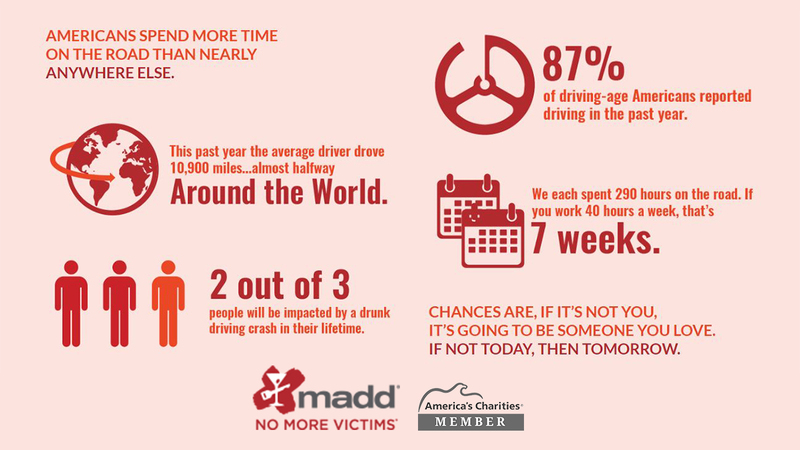 Together, MADD and DADSS are working toward a nation free from drunk driving. Click here to learn more about the advanced vehicle technology that MADD and DADSS are working on. Officers keep us safe in many ways, including on the roadways. They work long hours with low pay, deal with difficult situations, and put themselves in danger on a daily basis—and some pay the ultimate price. Forty-four percent of the officers killed in the line of duty were killed in traffic crashes. That’s why MADD supports these heroes who keep our roads safe, and supports law enforcement's use of sobriety checkpoints and crackdownds on impaired driving. Click here to learn why checkpoints matter and see what you can do to help prevent drunk drivers from getting behind the wheel. Since its humble beginning in 1980, MADD has evolved into one of the most influential and widely supported non-profit organizations in America. Until there are No More Victims®, MADD will continue to speak up and fight for stronger laws. Because the truth is, the solution couldn’t be simpler. It all boils down to a single choice. A commitment to never drive impaired.With your help we will arrive at a destination of zero deaths and injuries. Together we will see our dream come true of No More Victims. Click here to learn how you can be part of the solution. Support MADD Through Your Employee Giving Program!